Flexibility is the most important feature of this converter. THE CONV-X from ERO Australia is a microprocessor-based serial interface converter developed by for a smart field problems solution. * Conversion from RS232C to RS422A assuring the complete isolation between the two serial interfaces and the correct level signals for both interfaces. * Conversion from RS232C to RS485 with external handling of the line inversion (by RTS) assuring the compatibilities with other interface adapters. * Conversion from RS232C to RS485 with automatic handling of the line inversion. This solution guarantees not only the isolation and the correct level signals for both interfaces, but also a smart handling of the line inversion raising the software developer from all problems of line administration. The CONV-X is a multi-purpose interface converter designed to satisfy a wide range of industrial data comms requirements. The compact (48 x 96 x 125mm) DIN rail mounting CONV-X provides full three-way isolation of 1500V ac between all electrical paths. The CONV-X is provided with a 'watch dog' circuit allowing for automatic restart. Convenient power supply options of a universal 100 to 240V ac or 24V ac/dc allows the CONV-X to be utilised in installations through-out the world. One common application is the connection of multi-dropped RS485 devices to an RS232 system. 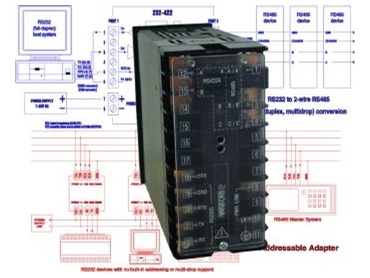 Using RS485 communications allows up to 32 modules of any type to be easily linked together. This simple "network" can then be interfaced to any standard PC RS232 port. The information available from each module can then be datalogged or monitored by any high level software package, or using SCADA packages such as Wonderware or CiTech, the modules on the RS485 network can be monitored and controlled. This application also enables the normal 15m maximum cable run for an RS232 port to be extended to 1200m using the CONV-X interface, enabling remote sites to be accessed.